Daly believes it is best for world's top golfer to "get this thing aired out, tell the truth"
(CNN) -- Tiger Woods has been told to go on television to try to finally end the controversy that has forced the world's No. 1 golfer to take an "indefinite break" from the sport. The American superstar announced on his Web site on Friday that he was taking time out to resolve the issues caused by his "infidelity" to wife Elin, having been mired in controversy since he crashed his car outside his Florida mansion late last month. Since then, several women have come forward to claim having had liaisons with Woods. Woods' compatriot and fellow golfer John Daly, who has battled gambling and alcohol addiction and also been married four times, believes the 33-year-old should tell all on a television program such as the Oprah Winfrey Show, the UK Press Association reported. "It's tough and it's going to be tough on him, but if I was him and Elin, I would go to Oprah, get on a show, get this thing aired out, tell the truth," former major winner Daly said. Blog: Woods cannot erase this stain. "And then it doesn't matter what the media says anymore because it's all out in the open and it would be a big sigh of relief for both of them." British publicist Max Clifford, whose clients have included the likes of magician David Copperfield and television mogul Simon Cowell, agreed that Oprah would provide the best platform. "Hopefully he can go on something like Oprah, maybe even with his wife, to show that they're making a real go of it," Clifford said. "The clever move would be for him to say, 'I'm coming back when Elin tells me the time is right.' That would be the masterstroke. "The golf world will miss him more than he will miss them because you're taking the world's top player out, the biggest attraction, the one that everyone wants to see way, way above everybody else. 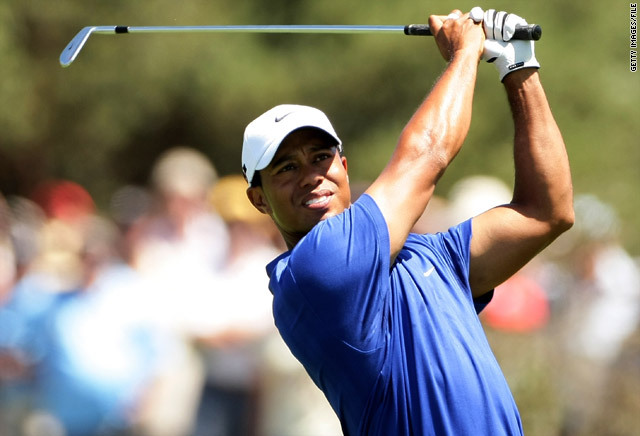 "That will encourage all of his fans to say, 'Come on Tiger, when are you coming back?' The demand for him to come back will get greater and greater." Former European No. 1 Colin Montgomerie, who was second behind Woods at the 2005 British Open, believes that the 14-time major winner now seems a little less perfect. "He is suddenly, I hate to say, more normal now," the Ryder Cup captain told the BBC Web site. "There is a mystique which has been lost now and let's hope that golf isn't damaged by that, and it shouldn't be. "There was an aura, and that wall has been split slightly, so there are cracks and I feel that it gives us more opportunity of winning these big events now."